By Dennis W. Viau; modified from a recipe in Keto Instant Pot cookbook my Maria Emmerich. I knew nothing of vindaloo. 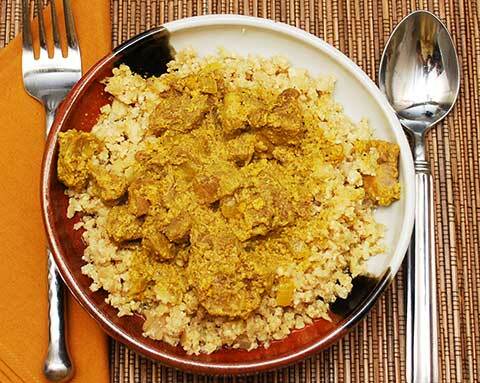 Some research revealed it is a popular dish in parts of India and is traditionally made with pork. This recipe interested me because I have an Instant Pot and I am on a keto diet. Because vindaloo is commonly a curry dish, I substituted curry powder for cayenne pepper. Melt the butter in a 6-quart Instant Pot using the Sauté setting. Add the onions and cook until tender, about 4 minutes, stirring often. Add the garlic and cook an additional minute. Press Cancel to stop the cooking. Place the mustard and spices in a small bowl and stir to blend. Place the lamb in the Instant Pot and add the mustard mixture. Stir to coat. Add the coconut milk and season with pepper. Stir again. Secure the lid on the pot making sure the vent is set to “Sealing.” Start the Pressure Cook function and set to High pressure. Set the cooking time to 30 minutes. When finished, let the pot depressurize naturally. Remove the lid and taste for salt. If desired, serve over a bed of rice (I used my Keto Fried Rice) and garnish lightly with lime or lemon juice.